We provide all kinds of Facebook tips and tricks like increasing Facebook fan pages likes, recovering your website from Facebook spam, Inviting all friends on Facebook to your page, Auto Happy birthday wishes app, Bloack game request on FB etc. 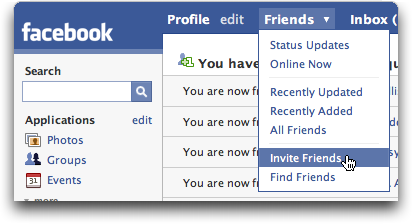 Facebook doesn’t provides the users to invite all the friends at a time for their fanpage instead the users must be invited one by one. If you have thousands of friends and if you start a new Facebook fanpage then you might feel it a big trouble to invite everyone individually. So here I’m giving you a simple method using which you can invite all your friends for your Facebook page instantly without much effort. Note : This trick works best with Google chrome browser and so I recommend you to go with Chrome instead of any other browsers. The steps are simple and you will get it working under 2 minutes even if you have a big count of Facebook friends. Carefully follow the below steps one by one. After the Facebook fanpage Name changing trick this is the next trick which is going to be very useful for all the FB admins. 1. Open your Facebook account and go to your fanpage profile from Google Chrome browser. 2. Click on the “See all” button next to the invite friends option. 3. Invite page will pop up showing a lost of your friends, now scroll till the last friend. 4. Auto invite all friends script is given below copy it. 5. Press F12 button from your keyboard and click on the “Console” tab. 5. Paste the code which you had copied in the previous step and hit enter. 6. Wait for a while until the script does it jobs by inviting everyone automatically one by one. If there is an error then go to “https://www.facebook.com/selfxss” and click on the check box and try again. If still the browser is not allowing you to execute the script then remove the URL from the browser and paste the below script. 7. When it gets completed you can check if all of your friends are invited by clicking on the “See All” button next to the invites tab. This is a simple method using which you can invite all of your Facebook friends to all of your fanpages within seconds without much of the hectic process. This entry was posted in facebook on Mar 1, 2014 by Rajesh. Facebook is the number one social network which is connecting millions of users worldwide and it is the best platform to share videos, pictures and messages with your friends securely. Facebook provides many features such as poke, message, write on wall etc and here you will learn how to wish birthday to your friends automatically by scheduling the wishes earlier onto their Facebook wall. If you are interested then you can learn the other best Facebook tricks of 2014 such as deleting anyone’s profile on Facebook, finding fake profile on FB, Downloading videos of your Facebook friends etc. 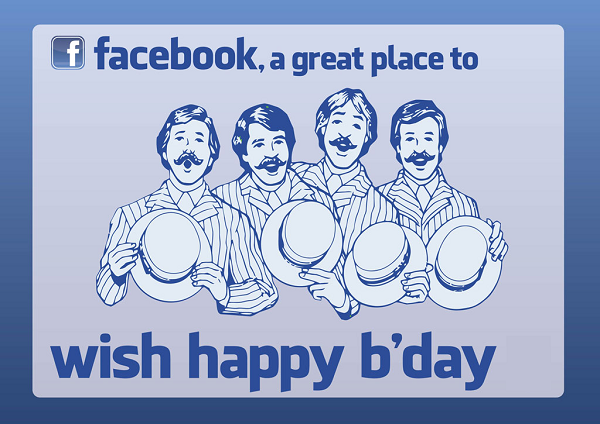 Go to the website BirthdayFB and click on “Connect with Facebook“. It would ask for permission and you click on “Allow” the app to access your profile so that it could post wishes on behalf of you. Move to the “Write a Message” tab and you can write different messages for every friends and schedule it earlier and save it. There are few templates for wishes and you could use one of them to save your time if needed. Once it is saved your friends will automatically receive a wish on their wall from you and that’s all because of that cute app. You can cancel a wish at any time by navigating to the “Scheduled Messages” and clicking on the “Remove message“. This is a simple trick to wish your friend on their birthday even though if you forget their birthday. Stay updated for more posts related to Facebook tricks. This entry was posted in facebook on Feb 22, 2014 by Rajesh.